There’s nothing quite like an original, and that’s certainly the case with our Grandes Original Breakfast Sausage. Made with no fillers or MSG, this gluten-free sausage is ready to be the star of your meal. If you’re looking for a way to add life to your mac and cheese, spaghetti squash, biscuits or casserole later in the day, you’ve found it. Order some Grandes Original Breakfast Sausage now! Ingredients: Pork, Water, Less than 2% of the following: Salt, Sugar, Potassium Chloride, Spices, Natural Flavors. Pre-heat gas grill. Place links on grill over medium flame for 20-25 minutes. Use tongs to turn links often until golden brown. Serve and enjoy! Allow the charcoal to burn until it is white-ash glowing embers. Place links on the rack about 7-9 inches above fire. Allow 20-25 minutes to cook thoroughly. Use tongs to turn links often until golden brown. Serve and enjoy! ALWAYS COOK SAUSAGE LINKS TO A MINIMUM INTERNAL TEMPERATURE OF 160° F USING A MEAT THERMOMETER. Nothing beats a pile of original large breakfast sausage links waiting for you at the table each morning! Whether you hop out of bed eager to greet the dawn of a new day or you hit the snooze alarm repeatedly before stumbling to the kitchen, you need a morning meal that will provide you and your family with enough energy to make it through the busy day ahead. Traditional large breakfast sausage is the ideal way to rev you up. Packed with 10 grams of protein and free of trans fat, our pork sausage makes a savory main course for your breakfast or an easy-to-prepare side dish to any other breakfast food. You can feel good about feeding your kids our sausage because it’s made from fresh ingredients. We never use MSG and our breakfast sausage is naturally gluten-free. 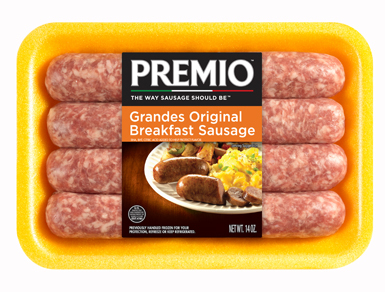 Premio Foods has been making sausage for families like yours for more than 40 years. We’re a family-owned business that prizes customer input. We love hearing what our customers and fans have to say about our sausage, our customer service, our recipes, our social media accounts and more. We count on your feedback to help make us a better and more responsive business, and to give you the sausage you want to nourish your family. We never take for granted the trust you put in us. We understand serving your family good food that’s also good for them is one way you show your love, and we want to help you in that quest, which is why we use butcher-quality cuts of meat in our sausage. We never use fillers and we experiment to find just the right blend of seasonings and spices for the optimal taste bud experience. Premio Foods offers a wide selection of sausages for our customers to choose from, including Italian, world flavors and chicken sausage. You can order directly from our website or use our store locator to find a nearby location that carries our sausages. Whichever option you choose, we’re happy to answer any questions that may arise about our products or getting them to you. Make breakfast your favorite meal of the day! Send the irresistible smell of sausage wafting through the house while you cook, and watch as your family eagerly runs to the table. Everyone will love and devour our breakfast sausage links.